DALLAS, TX--(Marketwire - October 21, 2010) - International research firm Parks Associates reports consumer electronics buying in the U.S. rebounded in the first half of 2010, with 63% of broadband households making at least one purchase, a rate 6% higher than in the first half of 2009. "The first half of 2010 brought good news for the CE industry, especially in smartphones and mobile tablet products," said Tricia Parks, CEO, Parks Associates. "Rates of buying were higher than for the same period in 2009 due to higher consumer confidence. That confidence dropped in 3Q, but as we approach the holiday season, sales prospects remain tempered but steady, assuming consumers do not shut their wallets completely due to discouraging economic headlines." Parks Associates reports smartphones promise to be the highest selling product through the end of the year, fueled by both repeat and first-time purchases. Twenty-one percent of broadband households intend to purchase a smartphone by year's end, according to the report "Consumer Decision Process: 1H 2010 and 2010 Summer Update." Of those intending to purchase a new smartphone in the next four months, 28% report an iPhone preference, 23% want a Blackberry, and 20% want an Android-based phone. 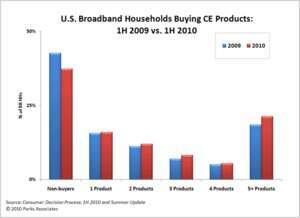 The study found that, on average, buying households purchased 4.3 CE products and spent $1,094 in the first half of 2010. Smartphones were a top purchase across most demographic segments, particularly among younger consumers, and 3-4% of broadband households bought at least one Apple iPad tablet. Parks Associates is currently launching "2010 Holiday Intentions," which will provide incidence of product ownership and data on 3Q 2010 purchases and purchase intentions for the 2010 holiday season.